Stainless steel sweep elbows were wearing through at ACRO Extrusion Corporation, causing considerable downtime, product loss, and maintenance expense. 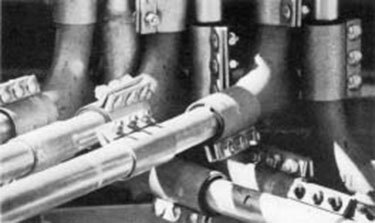 The sweep elbows in their pneumatic conveying system were wearing through every week to two weeks, requiring frequent system shut down. Due to the nature of the material being conveyed, (PVC powder) the sweep elbows also were prone to plugging on a regular basis, requiring further shut downs and cleaning every two to three weeks. Replacement of worn elbows, system shut down to clear plugged elbows, and clean-up of spilled material were having a negative impact on production. Environmental issues were an additional consideration. According to EPA regulations, the material being conveyed must not be released into the air or onto the ground. Complex clean-up and documentation requirements in addition to the possibility of fines were a further inducement to solve this problem. The Wilmington, DE, manufacturer of complete vinyl window systems also produces custom vinyl extrusions. Utilizing a vacuum system, PVC resin is conveyed from an outdoor silo into the plant's mixing room where it is combined with other ingredients to become PVC compound. The temperature and composition of the mixture is carefully controlled, as is particle size, which is held to 100-400 mesh — about the consistency of fine granulated sugar. When the compound has been thoroughly mixed and has been cooled back down to the correct temperature, it is then conveyed under pressure into two outside compound storage silos. As needed, the PVC compound is then conveyed into the plant itself where it is distributed to the extruders on the manufacturing line. The manufacturing process utilizes both vacuum and pressure pneumatic conveying systems and can move as much as 34,000 lbs. of material per day through a single line, reports Al Husni, Maintenance Manager of ACRO Extrusion Corporation. According to Husni, as the PVC compound was passing through the conveying system's sweep elbows, its impact on the elbow's interior wall caused elbow wear and also caused separation of the compound into its component materials. The many additives that make up the compound reacted differently to impact with the sweep elbow walls, some "bounce" more, some hardly at all. The net result was that some of the materials, like the waxes and TiO2, began to clump and adhere to the elbow walls, causing build-up and plugging of the elbows, in addition to causing wear. Another consideration for maintenance and repair of the conveying system was moisture when outdoor elbows leaked or had to be replaced. Moisture contamination can ruin an entire batch of the compound, rendering it unusable for production. Not at all satisfied with the situation, Husni responded to an ad in a trade publication and eventually installed ten 90° 2-1/2 inch tube size stainless steel Smart Elbow deflection elbows along with 20 Morris compression couplings as part of a 60 day free trial offer from HammerTek. The Smart Elbow deflection elbows have worked out extremely well; none have worn out in the 16 months since they were installed. "They've eliminated the wear problem and doubled the amount of operational time between cleanings," Husni says. An additional dozen Smart Elbow units were purchased eight months later. Another advantage cited by Husni was ease of installation and minimal space requirement, due to the compact design of the Smart Elbow model when compared to a sweep of the same line size. In reference to elbow wear problems, he offers a variation on the old "ounce-of-prevention" adage: "You would be better off installing safety measures like these Smart Elbow deflection elbows with their high wear resistance factor than discovering that 10,000 lbs of product has leaked out through a hole in an elbow and the EPA has fined you." HammerTek Smart Elbow deflection elbows can save your company time, expense and reduce regulatory paperwork by not failing in the first place. They are truly an intelligent "ounce-of-prevention" for conveying systems where any incidence of sweep-elbow failure has environmentally sensitive consequences. The patented Smart Elbow design provides maximum environmental protection by eliminating elbow wear due to abrasive impact and friction. The Smart Elbow deflection elbow eliminates/reduces: plugging, surging, turbulence, noise, product degradation, and streamer formation.